Yiu was one of only 10 recipients in the state of Oregon to receive the funds, which go to undergraduate students who “demonstrate a commitment to their academic pursuit of a STEM-related degree,” according to NASA. The awardees also demonstrated how their field of study relates to the NASA vision and the activities of one or more of the NASA mission directorates. For the past two summers, Yiu has worked with organic chemistry professor Jing Hao to research the synthesis of a thermo-responsive polymer that can be used for drug delivery, specifically anti-cancer drugs. 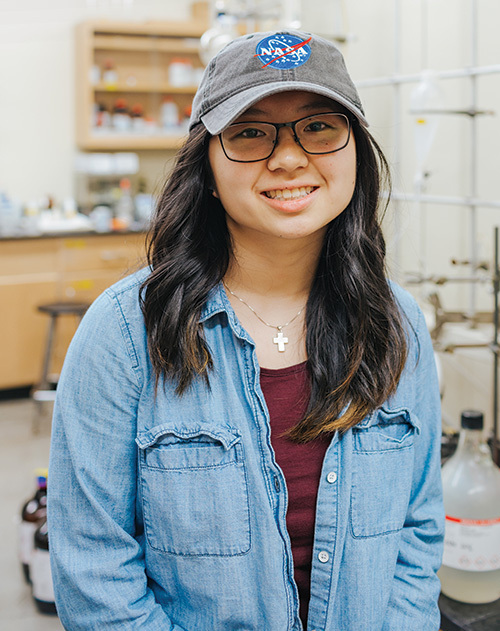 Ultimately, Yiu plans to use her chemistry degree to pursue a career as a pharmacist. Over the past two summers, Yiu created four different polymers that are thermo-responsive at different temperatures. Her polymers are able to form a micelle – essentially a shell that the anti-cancer drugs can be loaded into. At a specific temperature, the micelle breaks open so that the anti-cancer drugs can be delivered. Yiu presented her research at the Murdock College Science Research Conference in Spokane, Washington, in November – an honor, she believes, that helped her resumé stand out among the NASA scholarship applicants. She will also share her findings at the American Chemical Society’s national meeting and exposition March 18-22 in New Orleans.